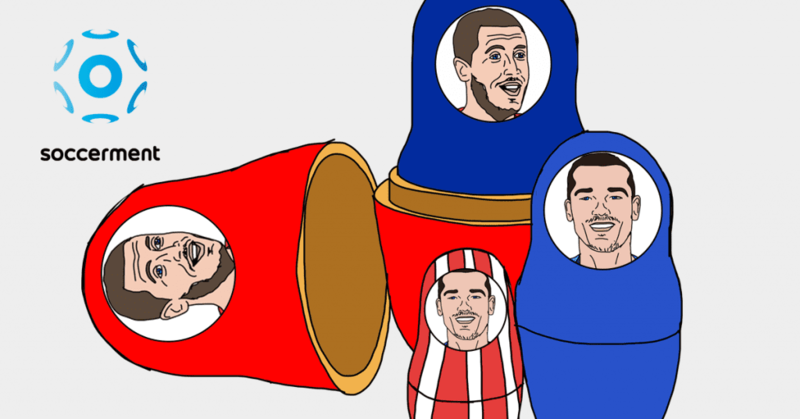 We look at ten ‘top players’ and compare their World Cup performances to their historical ones, determining whether – in Russia – they outperformed or underperformed vs their own standards. By reading this analysis you will discover the importance of the so called ‘spider charts’, a useful scouting tool. “Football is a team sport and not an individual sport. We win as a team, and every individual is better if we are part of the team” (F. Torres). Clearly, the performance of a football player is strongly intertwined with the one of his teammates. Many believe that Messi normally plays better for Barcelona than for his National team. Understanding how much of the (supposed) underperformance is due to his own psychological and/or fitness levels and how much of it has to do with the respective teams’ dynamics is, however, quite difficult from a numerical point of view. Not impossible, we will get there sooner than you might think, but it is definitely not straightforward. That said, we believe that, while the team’s dynamics can definitely alter the overall output of a single player, they are unlikely to make him/her a totally different footballer. We demonstrate this by showing a series of spider charts, related to ten top players who took part to the recent World Cup in Russia. Basically, we put our spider charts at use, to determine whether these players lived up to their standards, or not. The spider charts will look like a sort of ‘matryoshka dolls‘, with the larger “radar” detailing the better performance. 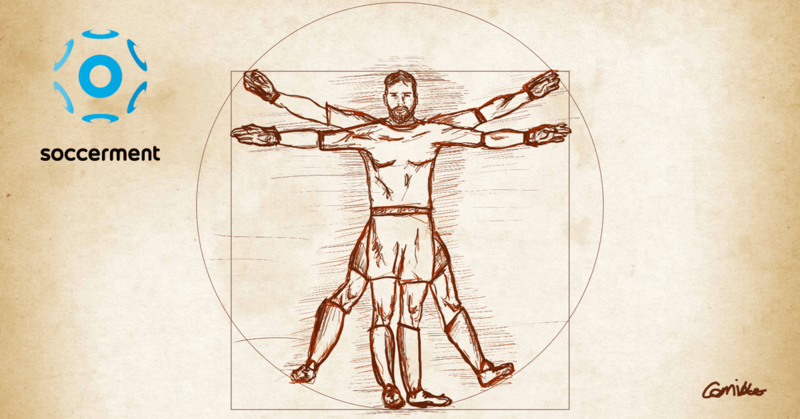 Similarly to matryoshka dolls, the SIZE of the spider chart of a football player could vary a lot from one competition to the other (or in different periods, during his/her career). On the contrary, it is way more difficult to see its SHAPE changing significantly (unless the player changed role). This is why the spider charts are a useful tool: they help at understanding what are the key characteristics and/or what could be expected from a football player. If used correctly, spider charts provide a great scouting tool. 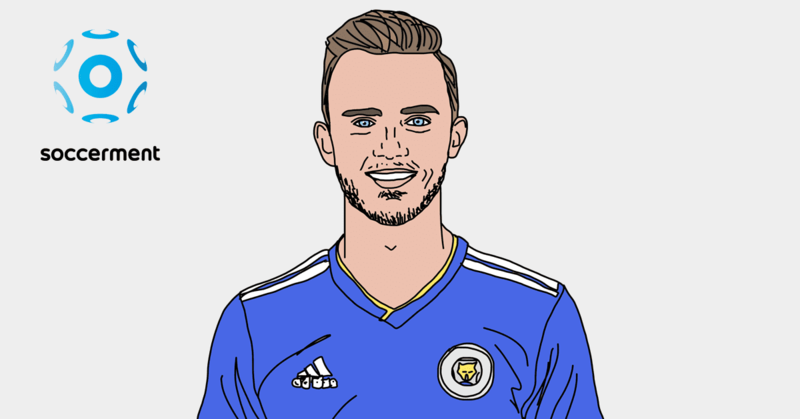 For example, to find potential similar replacements for a player who left a team, or to find the player in the squad who is most suitable to enhance some aspects of the team’s tactical approach. 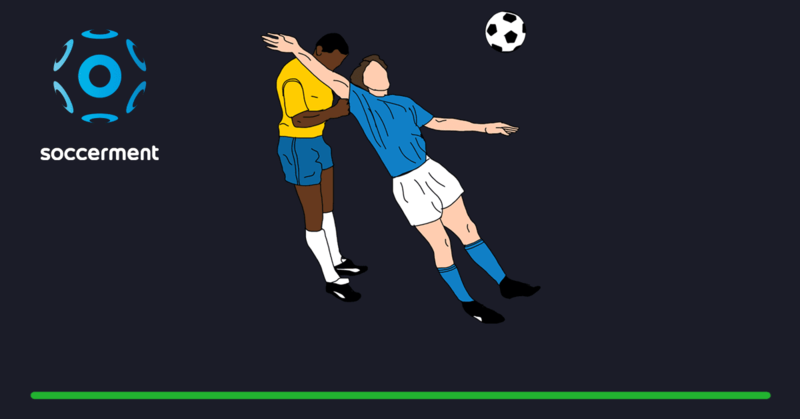 It is important to stress that three-to-seven matches of international football, in a short time span, cannot really tell us much, in terms of a player’s potential output. In fact, the size of the spider charts could often deviate a lot from the player’s standards. For example, playing 3 matches for Poland in the World Cup is totally different from playing an entire season for Bayern Munich. This is to say that we should not be misled by a few World Cup matches, believing that a footballer that we watched in a hot summer night (or afternoon), missing a few scoring opportunities, was overrated. Or vice versa, we should not come to the conclusion that the player who performed magically well above his standards in the Cup, will always perform at this new higher level, from that moment onward. 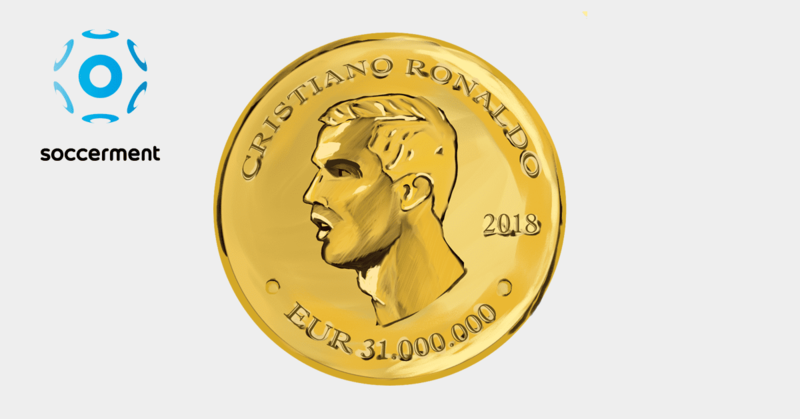 This message is mainly addressed to the recruiting departments of the professional football clubs: do not buy a player on the back of the World Cup’s outperformance and do not sell (at a discount) a player, because of the World Cup’s underperformance. If you have the opportunity, you should do exactly the opposite. In the paragraphs below, we go through each one of these players, showing the World Cup’s under/outperformance vs their historical standards. We use our ‘Soccerment Performance Rating’ (SPR) to determine that. Further, we are not showing the percentage value of the deviation from the historical standards, as the message may sound a bit too strong, for many. 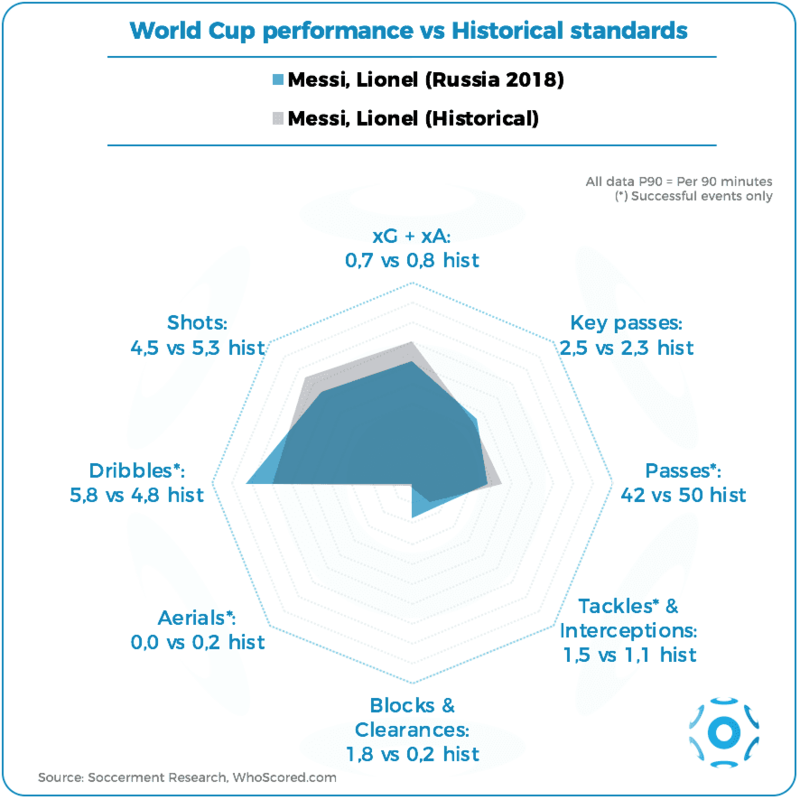 What we do, instead, is the following: in case the performance at the World Cup was more than 3% below the historical standards, we will say that the player underperformed. 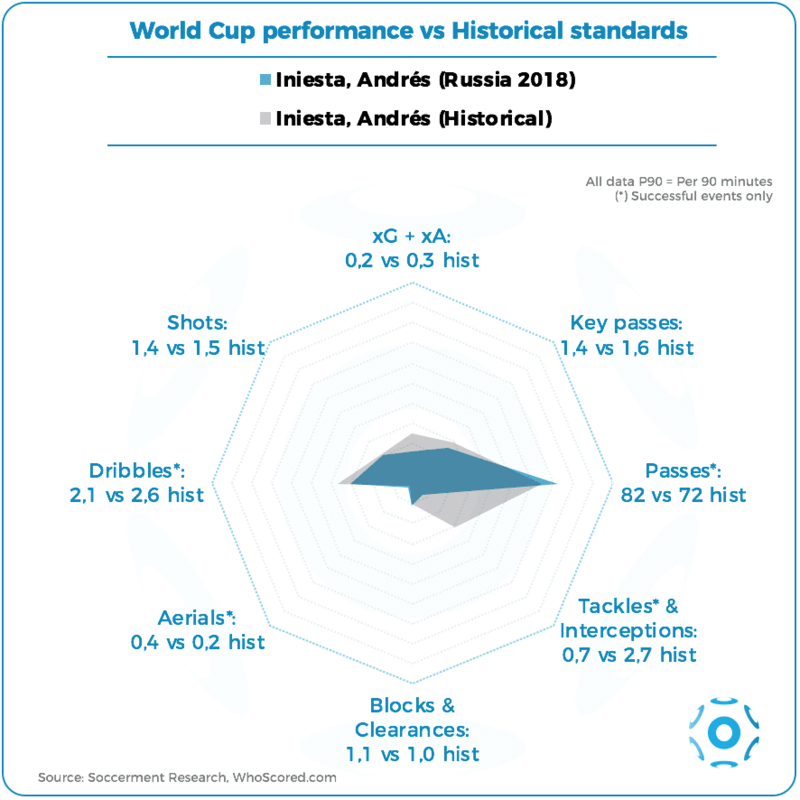 Vice versa, in case the World Cup performance were >3% better of the historical stats, we will say that the player outperformed. For anything in between, we’ll say that the player performed in line with his standards. Poland did not play a good World Cup, failing to qualify in Group H (vs Senegal, Colombia and Japan). Similarly, their most representative player, Robert Lewandowski, performed worse than expected. The spider chart below kind of speaks by itself. In blue, there is the description of his World Cup performance, while the grey area represents his output over the last nine years. 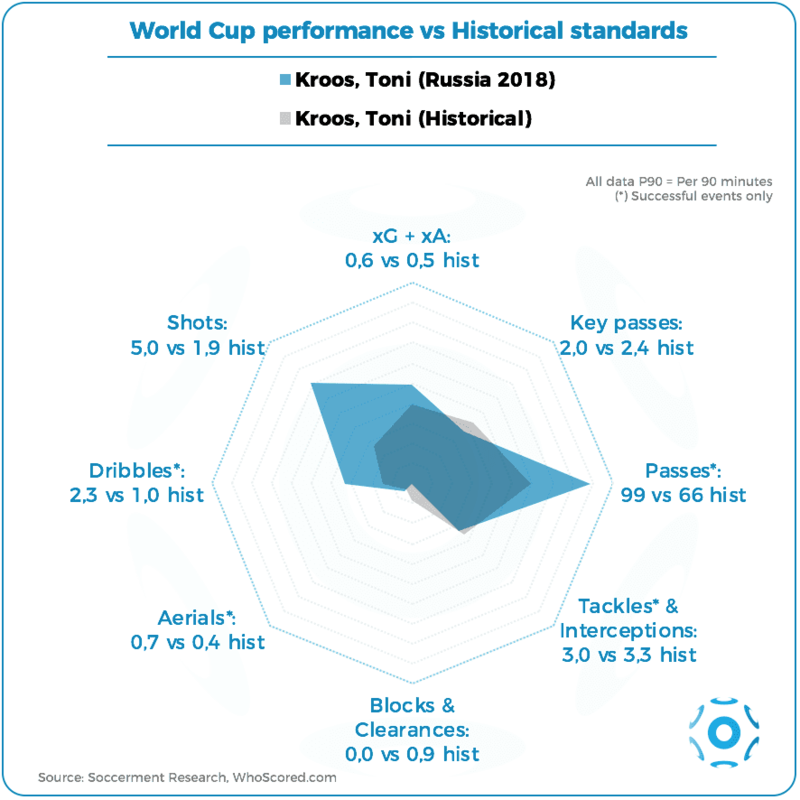 All the main World Cup metrics, especially concerning the attacking contribution, are well inside the much bigger grey area. The number of shots P90 was the main difference vs his historical standards. This can be easily explained. Poland’s number of shots per match were 10.3 at the World Cup, which means that Lewandowski’s contribution was 29% of the team’s total. As a comparison, in 2017/18, Bayern Munich were dominant in the Bundesliga, shooting 17.7 times per match, on average. Lewandowski’s share was relatively lower, at 23% (4.2 P90). 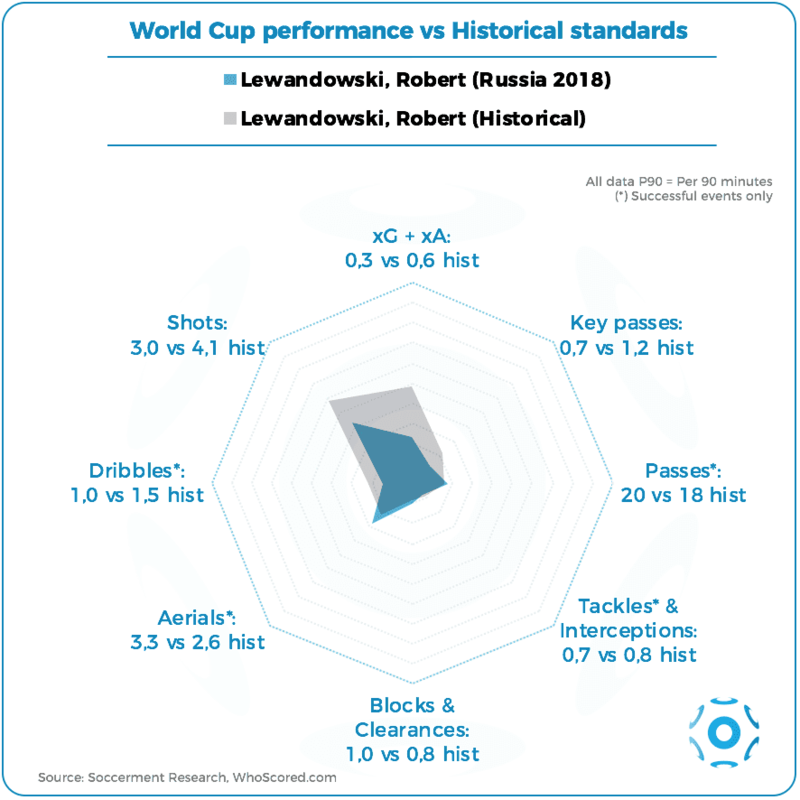 So, the worse performance of Lewandowski was mainly due to Poland’s poor attacking output. They were not able to help their main striker to shoot or assist from a valuable position (xG + xA of 0.3 P90 vs 0.6 historically). Among our findings, this will probably go down as the most controversial. In our minds, we still have the hat-trick that Cristiano Ronaldo scored against Spain. 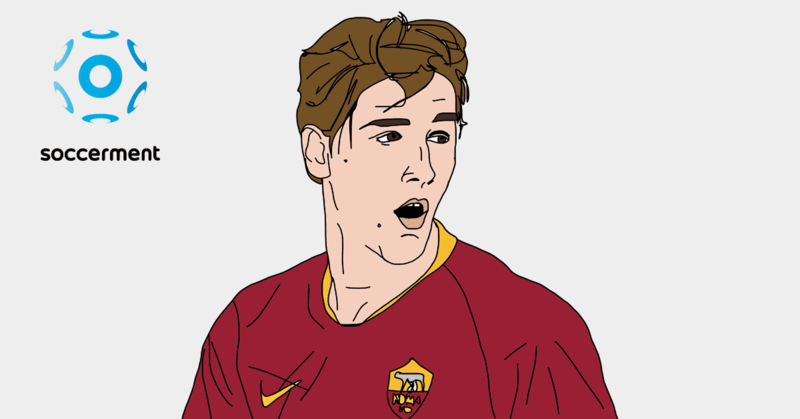 In particular, we recall that strong determination in his eyes, just seconds before the equalising free-kick. That glance will likely be shown again and again by TV programs and Youtube videos until the next World Cup (at least). We should not forget, however, that after the match against Spain, Cristiano Ronaldo scored only once more, against Morocco. He missed a penalty against Iran and failed to score also in Portugal’s defeat vs Uruguay. Basically, he underperformed compared to his normal standards. The spider chart below sheds some light on the underperformance. Expected assists per 90 minutes were 0.1 at the World Cup, while he normally creates 0.2 xA P90. The number of shots P90 was well above the average for forwards, but below Cristiano Ronaldo’s standards of the last nine years: 5.3 P90 vs 6.9 P90. Playing with Portugal is very different than playing with Real Madrid. When you are the main threat, defenders tend to mark you tightly, leaving much more freedom to the less dangerous players. This strategy cannot be applied with the same effectiveness vs Real Madrid, due to the presence of many other top attacking players (Benzema, Bale, Isco, etc..). So, at Real Madrid, Ronaldo ended up having more chances to shoot and assist teammates than he was able to achieve with Portugal. After the close of the transfer window, we will look at the potential line-up of Juventus and assess what kind of stats could Cristiano Ronaldo produce in Turin. At the World Cup, Cristiano Ronaldo’s underperformance was definitely not due to poor physical conditions. 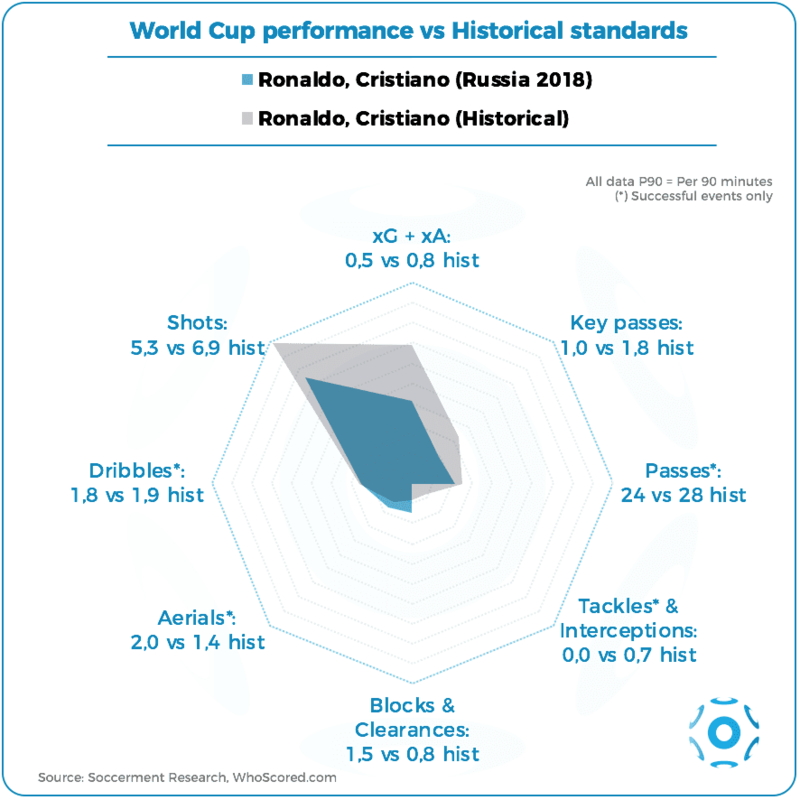 We touched on Cristiano Ronaldo’s great physical performance in the World Cup in this analysis. As we show in the spider chart below, the bulk of Messi’s underperformance came from a lower attacking contribution. The number of shots (per 90 minutes) he took during ‘Russia 2018’ was 4.5 vs his standard of 5.3. The lower amount of shots is mirrored by the higher amount of successful dribbles. From a tactical point of view, this is strictly correlated with Sampaoli’s ineffective tactical plan. Against very low defences, Messi was required to create numerical superiority by dribbling, or by dropping back to midfield in order to start the build-up phase. This pushed him away from the penalty box. Therefore, his lower contribution in terms of Expected Goals and Assists (0.7 P90 vs 0.8 historically). 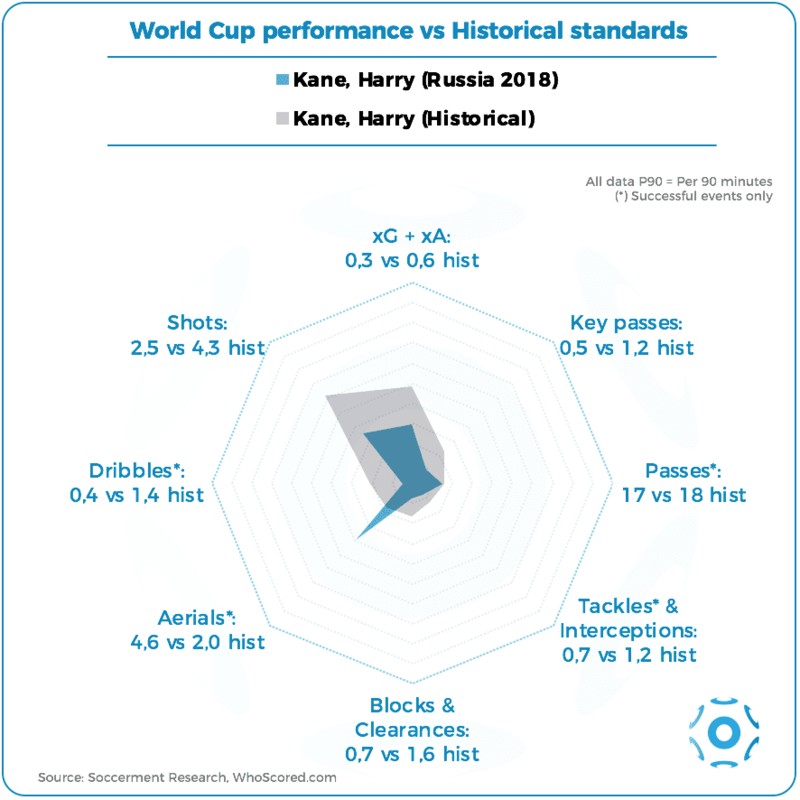 It might be counterintuitive, as Harry Kane won the World Cup Golden Boot with six goals, but we calculate that Kane underperformed, in terms of SPR, compared to his standards. The spider chart below helps at explaining where he did worse, or better, than usual. In blue, there is the description of his World Cup performance, while the grey area represents his output over the last six years. The number of shots per 90 minutes at the World Cup was 2.5, which compares to his normal standard of 4.3. The sum of Expected Goals and Expected Assists (per 90 minutes) was 0.3 at the World Cup, half the historical average of 0.6. Shot and pass accuracy were slightly below his standards too. Interesting to see the number of won aerials more than doubling at the World Cup vs Kane’s historical standards. We believe this should be due to England’s focus (and effectiveness) on set pieces. It wasn’t a good tournament for Spain and for Andrés Iniesta. The 34-year-old Spaniard, who scored the winning goal in the World Cup Final against Netherlands eight years ago in South Africa, retired from international football after ‘Russia 2018’. In Russia, he underperformed his historical standards, according to our SPR. The main deviation occurred in the attacking output, as well as in the defensive contribution, as we show in the spider chart below. 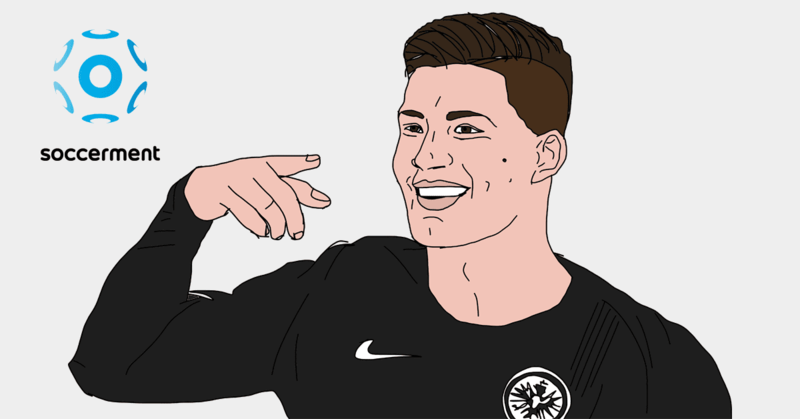 Germany’s failure to qualify in Group F (vs Mexico, Sweden and South Korea) was probably the biggest shock of the tournament. Despite the poor team performance, Toni Kroos was able to show his class (he also scored one of the best goals of the World Cup, against Sweden). In terms of SPR, we calculate that his output was, overall, not too dissimilar from the historical stats. A worse defensive contribution was, in fact, more than offset by a much better attacking contribution (more than double his usual standards). His build-up phase was in line with his historical average stats, i.e. on very high levels. From a tactical point of view, the numbers are influenced by Germany having to recover, most of the times, one or more goals. The opponents’ defenders thus stayed deeper, closing the possibile attacking solution. This led the German midfielders, Kroos in particular, to maintain ball control, in order to disorganise the defensive structures. Further, it encouraged them to often shoot from distance, in order to find scoring solutions. The World Cup Golden Ball winner Luka Modric played extraordinarily well throughout the competition, at least compared to many other central midfielders. Indeed, he easily entered our Top-11 selection. However, the Croatian’s World Cup performance was not too different from his normal standards, in terms of SPR. The spider chart below confirms this. The main deviation was related to the Expected Assists per 90 minutes, of 0.3 at the World Cup vs 0.2 for the historical average (xG P90 remaining at 0.1 in both cases). 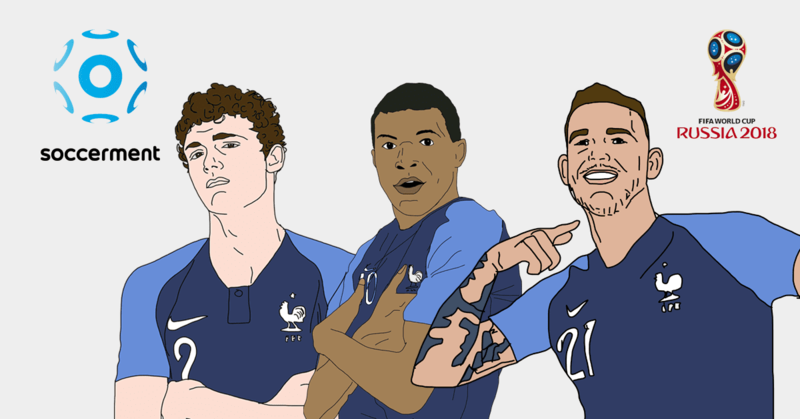 The World Champion Antoine Griezmann has been particularly praised by the media for his contribution to France’s build-up phase. The numbers confirm the view. The outperformance that we calculate vs his normal standards comes entirely from a better-than-usual build-up contribution. 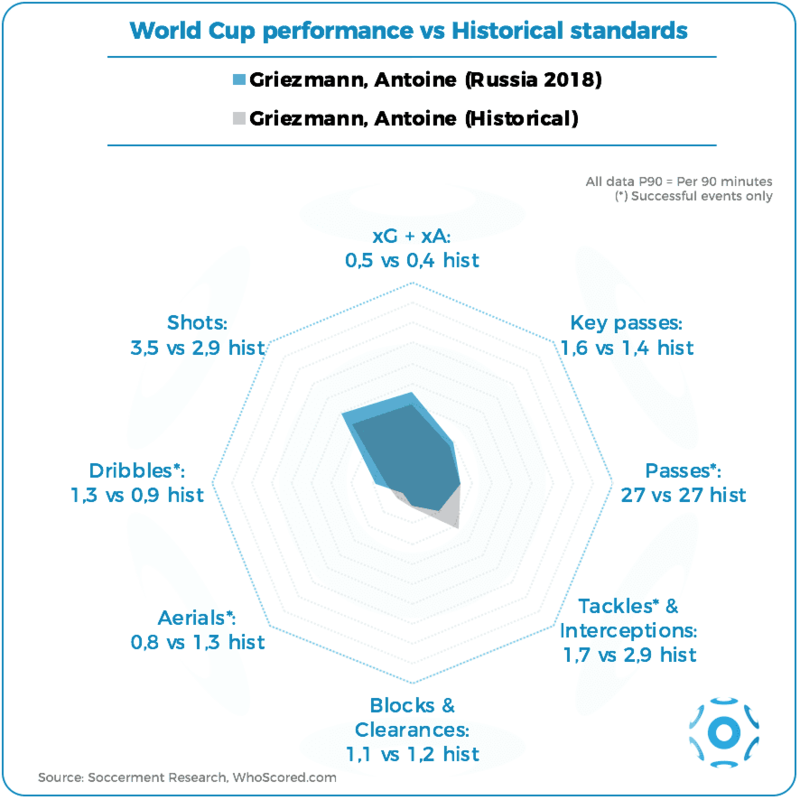 In particular, we see from the spider chart below that Griezmann created 0.2 Expected Assists per 90 minutes during the World Cup, vs his standard of 0.1 P90. Griezmann’s shot accuracy was also above his standards (50% vs 44% historically), but this incorporates the three penalties he took and scored. 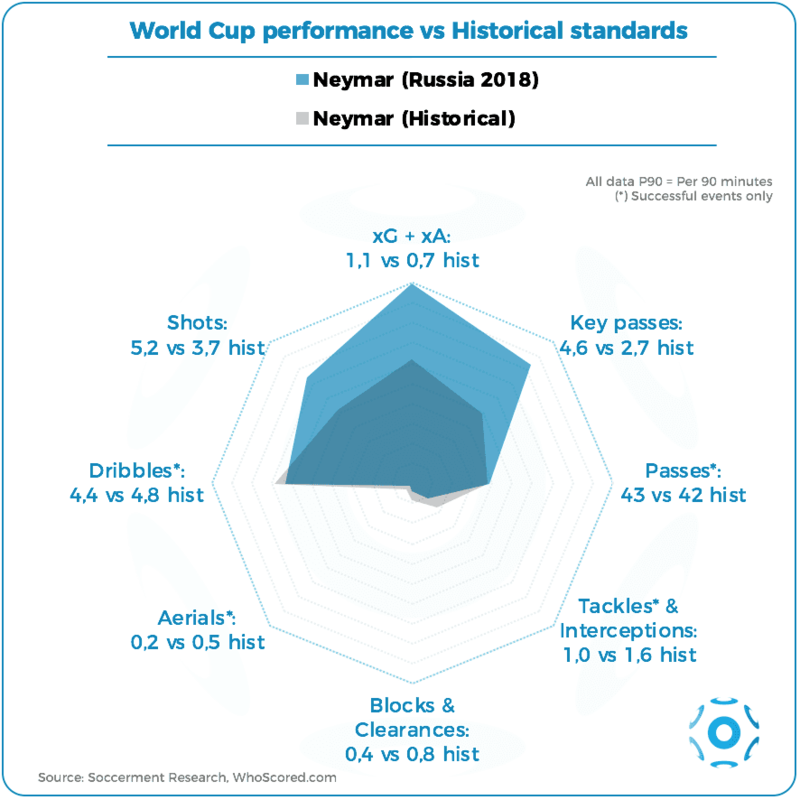 As we wrote here, Neymar’s World Cup performance wasn’t bad at all. The public disagrees: most of the push-backs we had after we published our top-11 list, were related to Neymar. The thing is, Neymar’s stats were good, what can we do? So good that they were better than his normal standards. We calculate a SPR outperformance, which mainly stems from his contribution to Brazil’s build-up phase. The following spider chart should speak by itself, although – perhaps – many people will anyway disagree. If you have a different view, you could comment our tweet here. 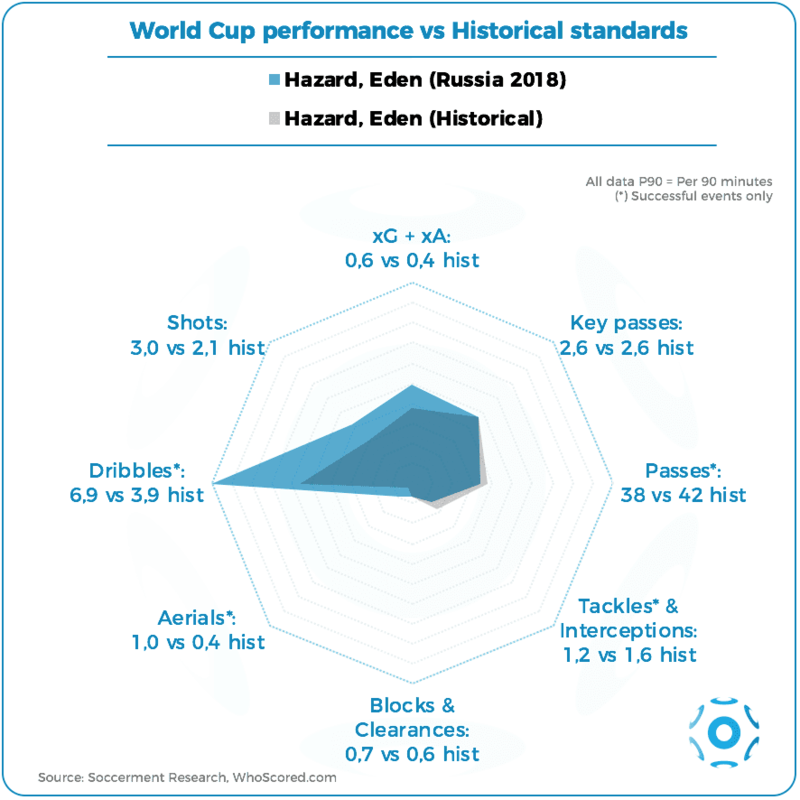 Hazard’s performance in Russia was outstanding, both relatively to the other World Cup participants and to his own historical stats. 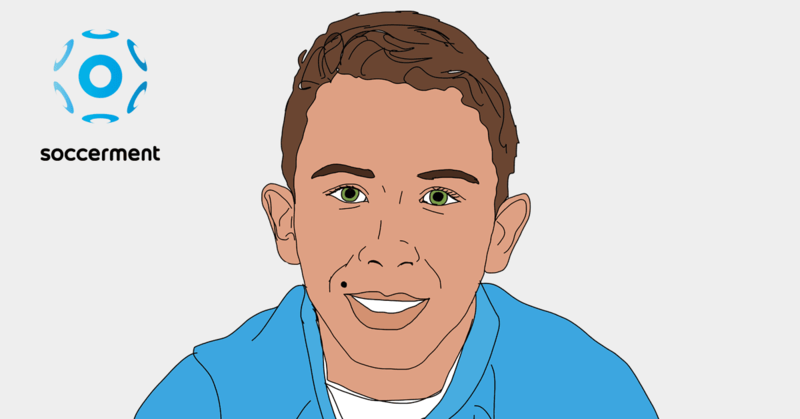 We calculate that Hazard outperformed his own standards, in terms of SPR, more than any other Top Player in this analysis. The spider chart below helps at explaining where he did worse or better than usual. The bulk of his outperformance came from a better attacking output (66% higher than his normal standards). 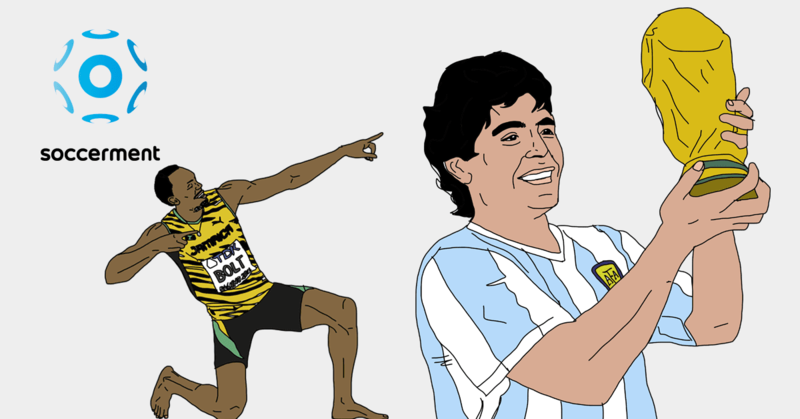 For instance, the number of shots per 90 minutes at the World Cup was 3.0, which compares to his normal standard of 2.1. The most outstanding number is the one related to successful dribbles (6.9 P90 vs 3.9 P90 historically). Martinez’s tactical plan influenced the way Hazard played. Most of Belgium’s attacks started with a ball played toward Chelsea’s player. His great 1vs1 ability gave him the chance to create numerical superiority and facilitate Belgium’s transitions. If you wish to review the spider charts in a video format, we uploaded an instagram video. For any question, comment or suggestion, do not hesitate to send us an email: research@soccerment.com.